In a previous blog post I explored the success of our study, The Web Never Forgets, in having a positive impact on web privacy. To ensure a lasting impact, we’ve been doing monthly, automated 1-million-site measurement of tracking and privacy. Soon we’ll be releasing these datasets and our findings. But in this post I’d like to introduce our web measurement platform OpenWPM that we’ve built for this purpose. OpenWPM has been quickly gaining adoption — it has already been used by at least 6 other research groups, as well as journalists, regulators, and students for class projects. In this post, I’ll explain why we built OpenWPM, describe a previously unmeasured type of tracking we found using the tool, and show you how you can participate and contribute to this community effort. This post is based on a talk I gave at the FTC’s PrivacyCon. You can watch the video online here. In my previous post, I showed how measurements from academic studies can help improve online privacy, but I also pointed out how they can fall short. Measurement results often have an immediate impact on online privacy. Unless that impact leads to a technical, policy, or legal solution, the impact will taper off over time as the measurements age. We built OpenWPM (Github, technical report), a generic platform for online tracking measurement. It provides the stability and instrumentation necessary to run many online privacy studies. Our goal in developing OpenWPM is to decrease the initial engineering cost of studies and make running a measurement as effortless as possible. It has already been used in several published studies from multiple institutions to detect and reverse engineer online tracking. OpenWPM also makes it possible to run large-scale measurements with Firefox, a real consumer browser . Large scale measurement lets us compare the privacy practices of the most popular sites to those in the long tail. This is especially important when observing the use of a tracking technique highlighted in a measurement study. For example, we can check if it’s removed from popular sites but added to less popular sites. We are using OpenWPM to run the Princeton Transparency Census, a monthly web-scale measurement of tracking techniques and privacy issues, comprising 1 million sites. With it, we will be able to detect and measure many of the known privacy violations reported by researchers so far: the use of stateful tracking mechanisms, browser fingerprinting, cookie synchronization, and more. Alongside the 1 million site measurement, we are also running smaller, targeted measurements with different browser configurations. Examples include crawling deeper into the site or browsing with a privacy extension, such as Ghostery or AdBlock Plus. These smaller crawls will provide additional insight into the privacy threats faced by real users. As a case study of the ease of introducing a new measurement into the infrastructure, I’ll walk through the steps I took to measure scripts using WebRTC to discover a machine’s local IP address . For machines behind a home router, this technique may reveal an IP of the form 192.168.1.*. 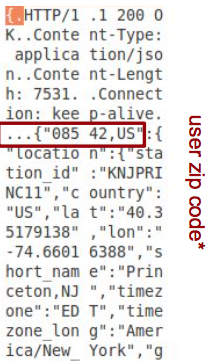 Users of corporate or university networks may return a unique local IP address from within that organization’s IP range. A user’s local IP address adds additional information to a browser fingerprint. For example, it can be used as a way to differentiate multiple users behind a NAT without requiring browser state. The amount of identifying information it provides for the average user hasn’t been studied. However, both Chrome and Firefox  have implemented opt-in solutions to prevent the technique. The first reported use that I could find for this technique in the wild was a third-party on nytimes.com in July 2015. A preliminary analysis  of a 50,000 site pilot measurement from October 2015 suggests that WebRTC local IP discovery is used on the homepages of over 100 sites, from over 20 distinct scripts. Only 1 of these scripts would be blocked by EasyList or EasyPrivacy. We envision several ways researchers and other members of the community can make use of OpenWPM and our measurements. I’ve listed them here from least involved to most involved. (1) Use our measurement data for their own tools. In my analysis of canvas fingerprinting I mentioned that Disconnect incorporated our research results into their blocklist. We want to make it easy for privacy tools to make use of the analysis we run, by releasing analysis data in a structured, machine readable way. (2) Use the data collected during our measurements, and build their own analysis on top of it. We know we’ll never be able to take the human element out of these studies. Detection methodologies will change, new features of the browser will be released and others will change. The depth of the Transparency measurements should make it easy test new ideas, with the option of contributing them back to the regular crawls. (3) Use OpenWPM to collect and release their own data. This is the model we see most web privacy researchers opting for, and a model we plan to use for most of our own studies. The platform can be used and tweaked as necessary for the individual study, and the measurement results and data can be shared publicly after the study is complete. (4) Contribute to OpenWPM through pull requests. This is the deepest level of involvement we see. Other developers can write new features into the infrastructure for their own studies or to be run as part of our transparency measurements. Contributions here will benefit all users of OpenWPM. Over the coming months we will release new blog posts and research results on the measurements I’ve discussed in this post. You can follow our progress here on Freedom to Tinker, on Twitter @s_englehardt, and on our Github repository. Notable exceptions include the study of cookie respawning: 2009, 2011, 2011, 2014. and the statistics on stateful tracking use and third-party inclusion: 2009, 2012, 2012, 2012, 2015. Crawling with a real browser is important for two reasons: (1) it’s less likely to be detected as a bot, meaning we’re less likely to receive different treatment from a normal user, and (2) a real browser supports all the modern web features (e.g. WebRTC, HTML5 audio and video), plugins (e.g. Flash), and extensions (e.g. Ghostery, HTTPS Everywhere). Many of these additional features play a large role in the average user’s privacy online. There is an additional concern that WebRTC can be used to determine a VPN user’s actual IP address, however this attack is distinct from the one described in this post. uBlock Origin also provides an option to prevent WebRTC local IP discovery on Firefox. We are in the process of running and verifying this analysis on a our 1 million site measurements, and will release an updated analysis with more details in the future.